There an abundance of Untapped Potential out there, if you know where to find it. Being able to find clients via Facebook Advertising is a spectacular addition to the toolbox of any Realtor. You can find the best buyer-seller relationships available and in a time-critical manner – so that your potential clients don’t start looking elsewhere. You can provide services that virtually no other Realtor is able to offer, and you can offer your clients an amount of detailed feedback that’s completely revolutionary. 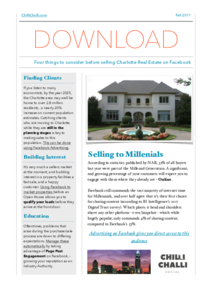 The technology available to the Facebook advertiser is PERFECT for Real Estate Sales – to the extent that it’s possible to create a mini-site within Facebook that will showcase houses to potential Buyers at the exact same time they are looking for them, and in the locations that they want to purchase, without ever leaving Facebook. Great for the User Experience, and even better for you. If you’d like more details, either email us, or schedule a free discovery call. If you’d rather go it alone, then please download our free Report to get you started.